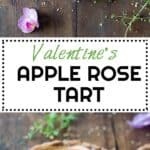 An apple rose tart that will make your loved one drop their chin! It’s not only a piece of art but also absolutely delicious. A crunchy nut crust with sweet apples and maple custard, what else can you want in life? 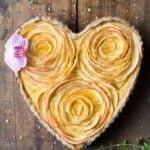 This apple rose tart is one of my most popular desserts on the blog and I have decided to update the photos to make them look more like, well now. In addition, I shot an instructional video for it so you can see with you own eyes that this is totally doable. I do not necessarily consider myself a very crafty person which is why I am double proud of having been able to make this look so beautiful. Oh and if I was able to do it, YOU will definitely be able to do it, too. It really isn’t as hard as it looks. It just takes a bit of time and patience. That’s it. You can make this tart with any crust you like of course, however, in my opinion there is nothing that can beat the perfection of the apple-walnut combo. This crust contains a cup of walnuts and it tastes hea-ven-ly! I added a bit of almond flour, too to make sure it doesn’t taste bitter. The crust is entirely made of nuts though, no wheat flour and thus is gluten-free. Coconut oil and an egg hold the curst together and a couple tablespoons maple syrup make it sweet. The best part? I takes about 3 minutes to transform the ingredients into a moldable dough. 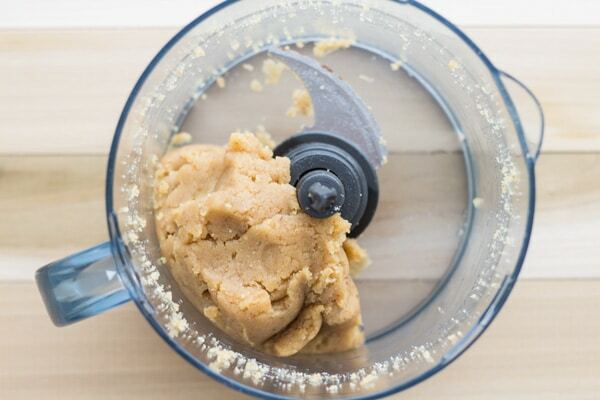 You start by pulsing the walnuts in a food processor until flour-like consistency. Add the rest of the crust ingredients, process until a ball forms and voilá, your nut crust is ready. How to prevent apples from browning? Exposure to air/oxygen makes apples brown. In order to prevent the apple slices from browning, place them in lemon water. The water will keep air away and the lemon’s acidity helps keep them from browning even once you removed the slices from the water. Add about 2 liters (half a gallon) of water to a bowl. Squeeze the juice of half a lemon into the water and mix well. Place your mandoline on the edges of the bowl and start slicing. The apples slices fall right into the lemon water and thus never turn brown. How to form apple roses? 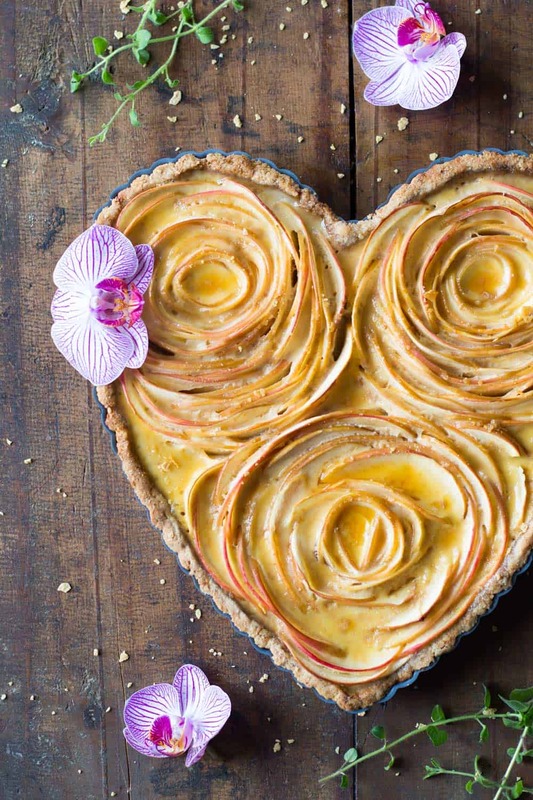 An apple rose tart wouldn’t be an apple rose tart if it had no apple roses, right? Form at least one apple rose. 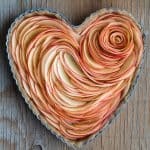 The first time I made the tart I formed one rose and then arranged the rest of the apple slices around it. The second time I made it I figured the tart would look even prettier with several apple roses. 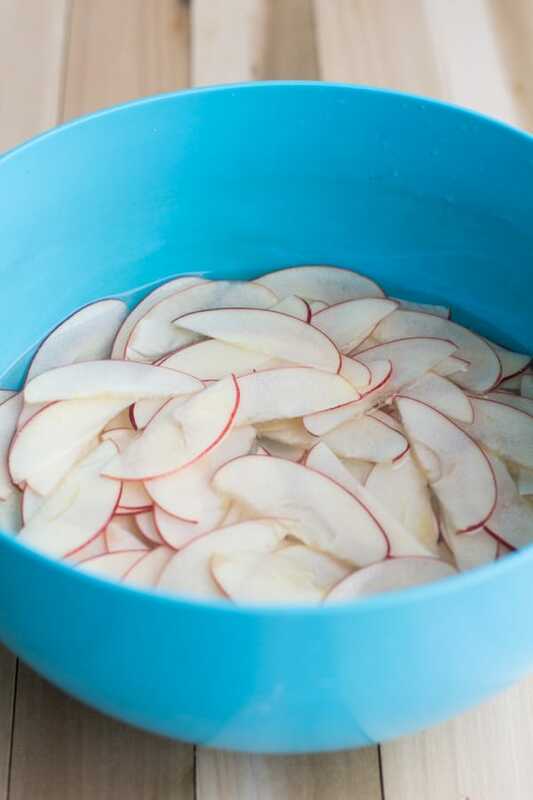 Here is the trick: you will need very moldable apple slices. Submerge a couple of apple slices in boiling hot water for a couple of seconds only. Remove immediately with tongs so they don’t overcook. Wait for the slices to cool down a little so you don’t burn your hands. You should be able to form any shape of your liking without them braking. Do not submerge all of the apple slices in boiling water because they will become all mushy and won’t stand nicely. Only submerge the ones for the center of the rose. Start by rolling up one slice very tightly (center of the rose) and then add in more slices around it in a circular motion. Place the small rose it in your tart pan. Hold the center with one hand and form the outer layers with the other. The slices are wet and therefor nice and sticky so the rose shouldn’t fall apart too easily. Have a dish cloth handy in order to tap the apple slices dry a little bit and avoid the crust from soaking in lemon water. Once the Rose is formed you may want to continue with the slices that are soaking in the lemon water which are crisper than the ones that were in boiling water and therefor stand straighter. Continue filling the pan until the apple rose tart is all finished. It takes literally 1 minute to make the custard because you don’t have to cook it. Just add all ingredients in a bowl (preferably with a spout for easy pouring) and whisk. Egg, egg yolks, evaporated milk (homemade if you can), and maple syrup. That’s it. Easy peasy! 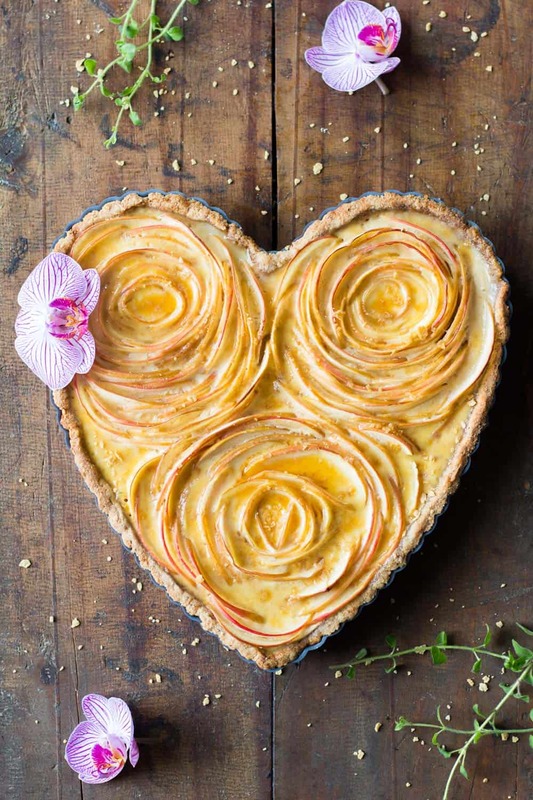 So now you know how to make an apple rose tart! I hope you will enjoy making this as much as I did and I also hope the person you are making this for is willing to share at least a little bit with you because it really, truly tastes heavenly! P.S. if you believe this is too hard to accomplish … DON’T believe that!!! Add walnuts to food processor and pulse until flour like consistency. Add almond flour, 1 egg, coconut oil and 2 Tbsp maple syrup into food processor and process until dough starts forming. Place dough in the middle of your baking pan and spread out with your fingers until the whole pan bottom and sides are evenly covered. Make sure the sides are thick enough to not break when removed from pan. If the dough becomes too sticky either use parchment paper in between fingers and dough or put dough in the freezer for 10 minutes and then start spreading. Fill a big bowl with lukewarm water and squeeze juice of half a lemon into the water. Place tart pan with crust in the fridge while slicing apples. Preheat oven to 350 F (180 °C). Wash, core and quarter one apple at a time and finely slice it letting the slices fall into a large bowl with lemon water until all apples are sliced. Use a mandolin slicer, a knife will NOT make the trick unless you are a ninja. Submerge a hand full apple slices 10 seconds in boiling water, remove and then form rose(s) with the slices. Then continue filling pan with apple slices around the rose(s) until full (as described and shown in pictures above). In a small bowl whisk together evaporated milk, 1 egg, egg yolks, and 1/4 cup maple syrup and slowly and carefully pour custard into wholes between apple slices. Bake for 35-40 minutes at 350 F (180 °C) until crust and apple tops start browning. Let cool down to room temperature and then refrigerate for at least 1 hour for custard to solidify to required consistency. Sprinkle Maple Flakes on top of everything and decorate with flours (optional). 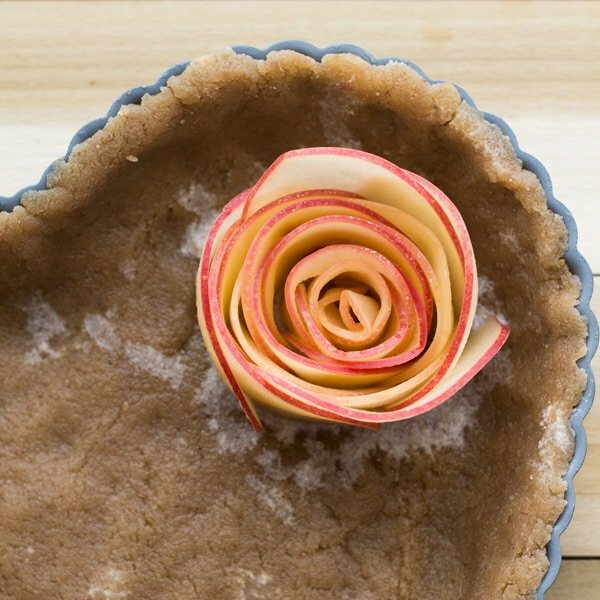 I can’t seem to find the video… There is a green heading that says: “Video of how to make an apple rose tart” but I don’t see any actual video. Is it just me/my computer, or is anyone else having this issue as well? Hi. What size tart pan did you use? I don’t see it mentioned at all. Thanks! Hi Diane, I’m not sure how to measure it because it’s heart-shaped and I can’t find it on Amazon. I bought it in a kitchen shop here in Montreal. It fits the same amount as a 9-inch round tart pan. The heart-shaped pan fits both my hands inside, you can get an idea about the size in the video. This is so beautiful and it looks delicious too! I actually like your first version with just the one rose best. I’m going to make this soon for my family rather than waiting for February. Any time of year is perfect for showing our families how much we love them! Hi Lyn, thank you so much for taking the time to leave such a beautiful comment :) You are absolutely right, any time of year is perfect or showing our families how much we love them! Thank you for reminding me! Hi Bridgitte, I’m sorry I missed your comment. Just saw it. 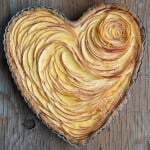 You probably made the tart for Valentine’s Day? The problem with it being hot is that the custard is quite liquid. It’s better to let it cool so it solidifies and is easier to cut. Just a question about the crust: does it need to be baked first before the custard or is it fine to bake them both together! Ps: I’m so excited to surprise my fiancé with this!! Absolutely stunning! What red apples do you suggest using? A lot of red apples when you cook them get really mushy. I used macintosh but fuji work fine, too. They are not completely red but I like that. They have mixed colors. The floury ones are the ones that get all mushy. I don’t know where you live and what you can get at your local store but I suggest buying 3 different apples first and trying them. The floury ones with thick skin are not suitable. Find some that are super juicy and have a thin skin. 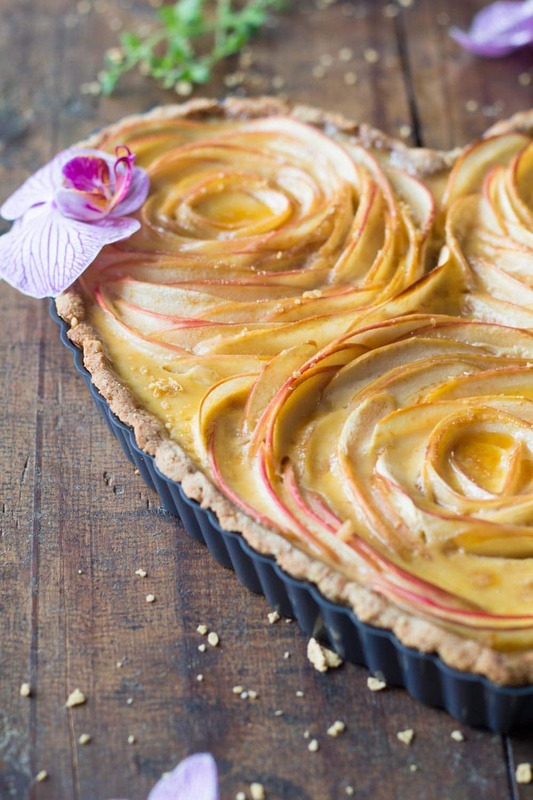 Your apple tart is truly a work of art. Also, loved the tip on how to keep apple slices from browning. Thank you for the recipe and the apple tip. Thank you Sue. I’m blushing :) Yes, I got that tip from my Peruvian grandma. Priceless! Yum! I’m more of a cook than a baker, but this one may convert me. Where did you find the heart shaped tart pan? Hi Heather! I found it in a kitchen shop in Montreal :) I’ve seen it on amazon at times but the ones they have right now are smaller. The one I have fits both my hands flat in the pan. You can always use either a round one or two of the small ones on amazon and divide ingredients between the two pans. Baking time should be the same. Thank you Trish! Happy Valentine’s Day to you, too ? Absolutely beautiful, Lorena! Your first effort is pretty stunning, too! What an absolutely beautiful design with those apples! Incredible! This is a beautiful pie. I’m saving in my Valentine’s pinterest board. This is definitely a must try! It’s absolutely gorgeous! I was wondering though, is there a substitute you can use for the maple syrup? Hi Amanda! Absolutely, you can use liquid honey in equal parts. If your honey is crystalized warm it up just a tiny little bit until it is liquid. Holy cow! This is so beautiful. Your writing gives me confidence to possibly try this myself someday. This is truly beautiful. So, so impressive. OMG!!!!! This is too beautiful to eat.